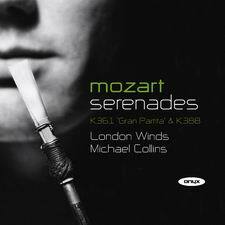 For purely musical reasons of improved blend and balance, London Winds have performed K361 for many years with contrabassoon rather than double bass . Mozart clearly indicated string bass in the autograph, but equally the contrabassoon and its players in 1780s Vienna would have struggled with the required articulation of the part, and by the early 1800s the instrument had improved to the extent that the first printed edition of K361 uses contrabassoon and Beethoven gives it prominence in both the Fifth Symphony and Fidelio. Mozart himself specified contrabassoon only once: in the Masonic Funeral Music K477, where its role is more sustained and technically simpler.